FANBOY PLANET.com . 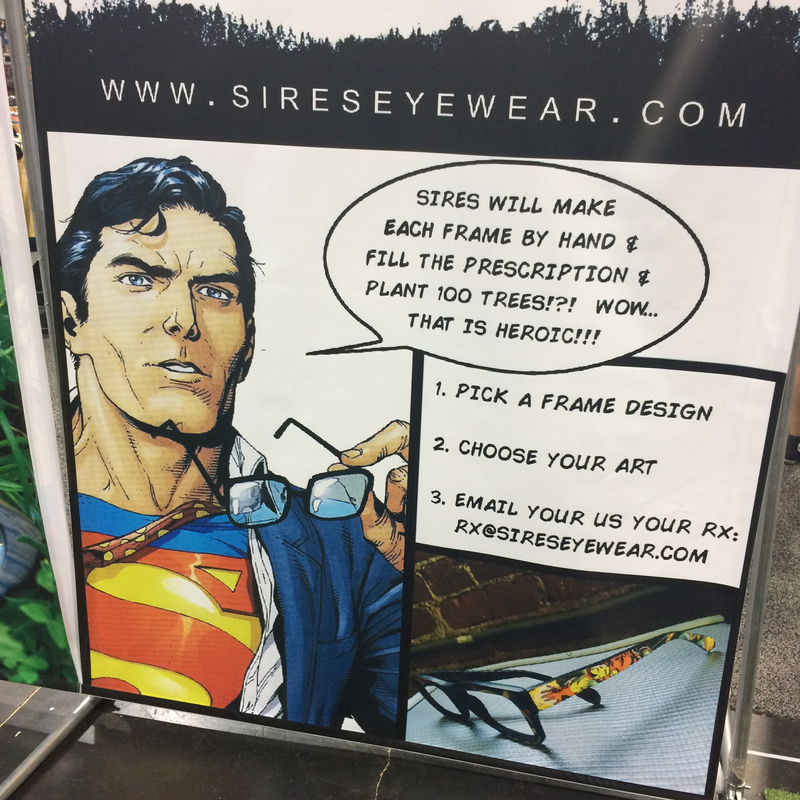 : 2015-WonderCon-Sires-Eyewear :. Why, With Your Glasses, You're Superman! A good pair of glasses has been crucial to fandom since at least 1938, when Clark Kent first took them off to reveal he was Superman. (Or Superman first put them on to disguise himself as Clark Kent.) At WonderCon this year, you can discover a company that has taken it a step further after only almost 80 years. 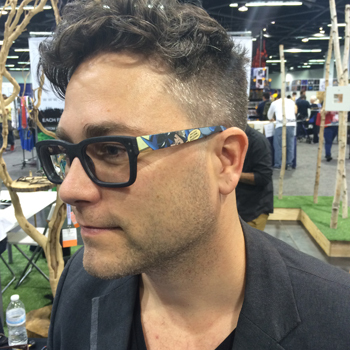 Sires Crown Eyewear will allow you to wear Superman on your glasses. 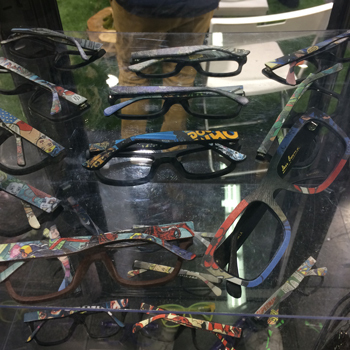 In itself, that's not necessarily new, as over the years Warner has licensed the little "S" shield for sunglasses and probably frames, but Sires has taken it a step further into social consciousness. Using a polymer made from cotton fiber, their frames are actually environmentally friendly. Actually, they're essentially wood. In exchange, working with with an environmental group, for every pair they sell, Sires will plant 100 trees. As their sign at Booth 1678 in Wondercon says, "wow... that IS heroic!" But that's not enough to make this company a destination for our fanboy people -- it's that (yes, for a price) you can customize your frames to reflect your fandom. Choose your preferred art -- and you can send them a panel or a logo -- and they will print it directly on your frames. 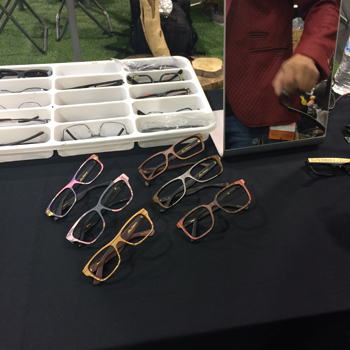 This isn't just for fashion, as they are a full optical house and will create glasses to match your prescription as well. So sunglasses or prescription lenses, you can flash your fandom on your physiognomy without the heartbreak of a tattoo years after no one remembers who Ambush Bug was. If you know anything about the optical eyewear industry, you may have heard that the many brands consumers have at their disposal are actually controlled by only three companies. So if your social conscience wants an extra boost, there's this: Sires Crown is a small business run out of downtown Los Angeles, doing their work onsite. They're creatives. They're committed. And yes, though they are running a Wondercon special, they're a little pricey compared to Lenscrafters. But the concept is just so cool and conscious. So that's more than you might usually drop on a pair of glasses. That's understandable. But if you're on site at Wondercon, stop by and check them out. You may be as intrigued as I was, and consider it. Once again, that's at Booth 1678.